The more the merrier as crowdfunding platforms find their place in the market. Boston, January 29, 2015 – The evolving financial crowdfunding industry is diverse, and institutional investors are finding new ways to engage with this new asset class. But what do its platforms say about its future? 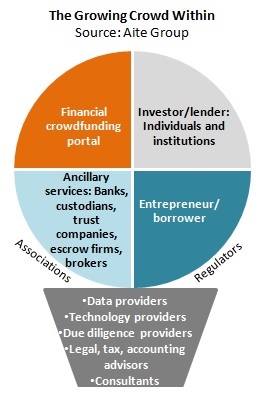 Is financial crowdfunding a disruptor, providing an alternative approach for investment? Is it a leveler, providing funds access to far more people and institutions? And can financial platforms bust the myth that crowdfunding represents doom for investors and participants? This research provides evidence of the growing interest and expansion of financial platforms in the United States and United Kingdom—it shows the range of platforms and their increasing activity, and it considers the growing development of this market in terms of platforms, backers, and service providers. This report is the second in Aite Group's two-part series on crowdfunding—find the first here. This 30-page Impact Note contains five figures and seven tables. Clients of Aite Group's Institutional Securities & Investments, Wealth Management, Wholesale Banking & Payments, Retail Banking & Payments, or Life Insurance services can download this report.